I hiked into Mt. Baker last week to spend the weekend with the 2013 Girls on Ice team. Their camp was perched on a rocky outcrop just above 6,000 ft on the Metcalfe moraine, immediately off the Easton glacier. 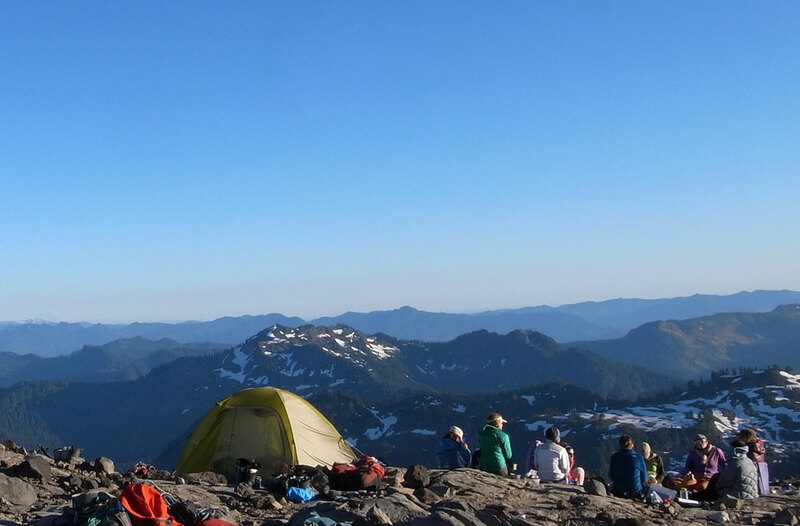 It had a stunning view that ranged from Mt. 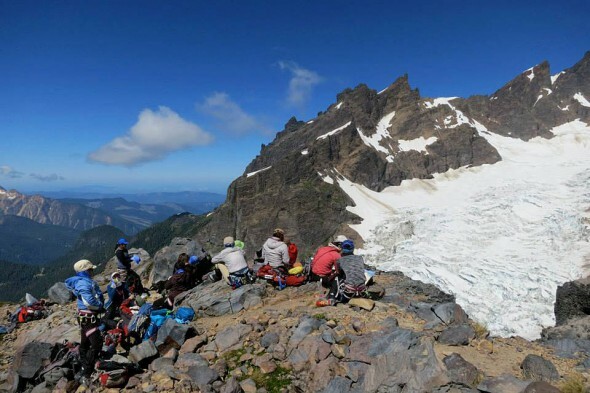 Baker’s summit (and actively venting crater), to a stunning icefall, and range of mountain peaks that gave way to the San Juan Islands in the Salish Sea. I arrived on Friday evening and stayed until Sunday afternoon to have time both to work with the program and do my own personal paintings. I packed my Art Toolkit as well as a tube/drawing board with larger paper. I tried to pack light since I also brought my glacier gear (ice ax, helmet, harness, crampons) and camping equipment! The weather was stunning, and we spent Saturday traversing the Easton Glacier, stopping along the way to sketch a beautiful icefall on the Easton glacier. 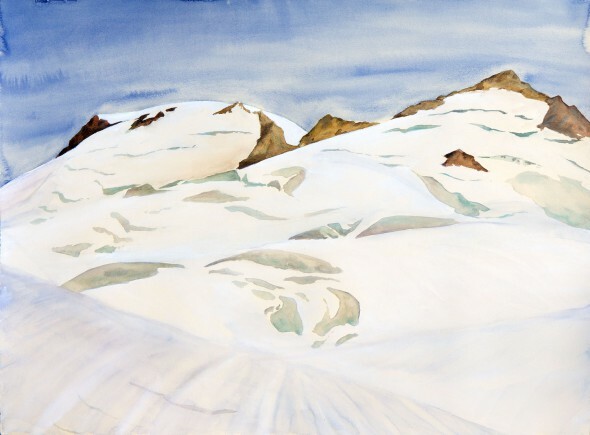 I encouraged the team to squint and observe the big shapes as well as the gesture and rhythm of the ice forms. 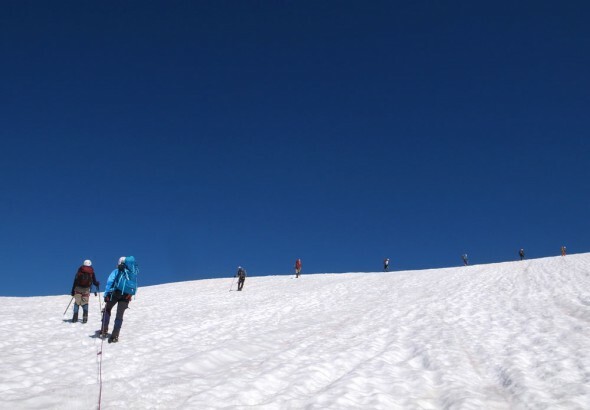 This was my fourth time on the Easton glacier with Girls on Ice. I first gave a workshop to the program in 2007, and taught as a full time instructor in 2008 and 2009. It was the beginning of my North Cascades project and many field sketches and paintings. 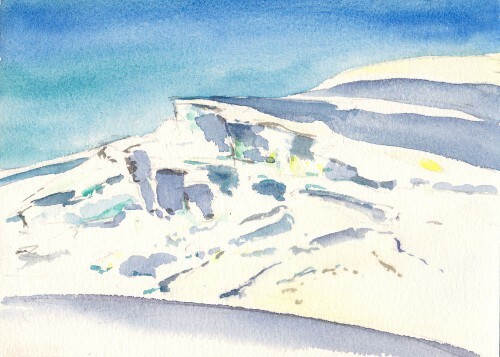 Here’s one of my sketches from 2008 of the same icefall and the painting it inspired! 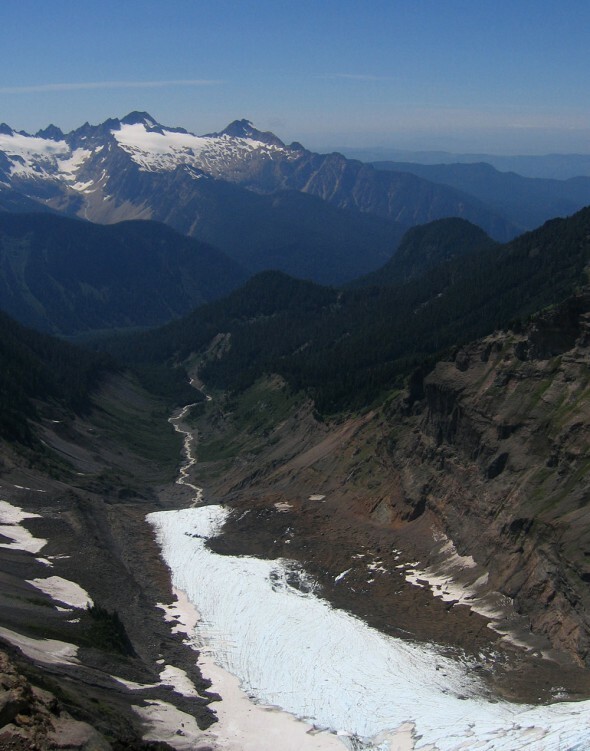 Continuing across the Easton glacier, we arrived at an impressive overlook of the Deming glacier, valley, and icefall with the peaks of the Black Buttes looming behind. They frame the caldera of an extinct volcano, the lava of which forms part of Mt. Baker’s bedrock. 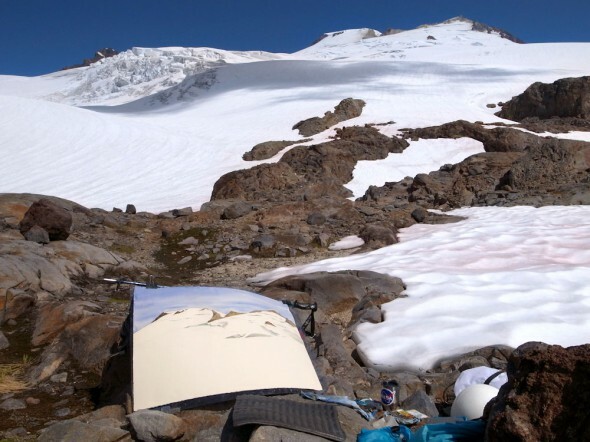 I began to sketch the Black Buttes and Deming icefall, using large paper that I’d brought with me in a plastic roll. I developed the plastic drawing board for my Imaging the Arctic Greenland project, but this was the first time I’d used it in the mountains. 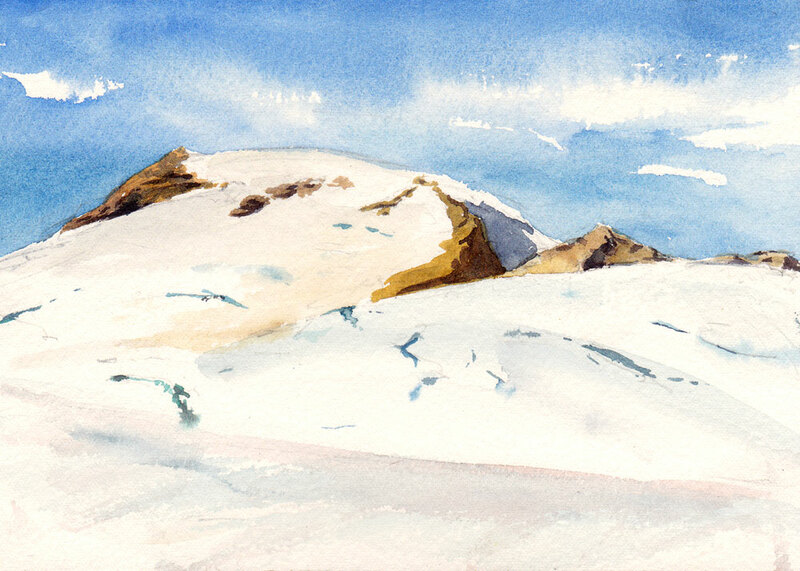 After clamping the board to my ski pole, I sketched with paints from my two pocket palettes. My materials felt all in all successful, but next time I will bring larger brushes! I had only a few waterbrushes and one medium round sumi brush with a very short handle (I’d chopped it down to about 3″ to save space and weight). We ate lunch and I presented a Tools for Observation workshop to the team. After gesture sketching together, I gave everyone personal time to sketch and journal. I wish all of my workshops could be in this dramatic of settings! Finally we headed back to camp, to bring the wonderful day to an end. After dinner, I helped lead an exploration of the questions, “How are art and science similar? How are they different?” Then we ate dessert and watched the sun go down. The GOI team rose very early (3am) the next morning to climb the summit, and I woke up a little less early (5:30am) to paint it. 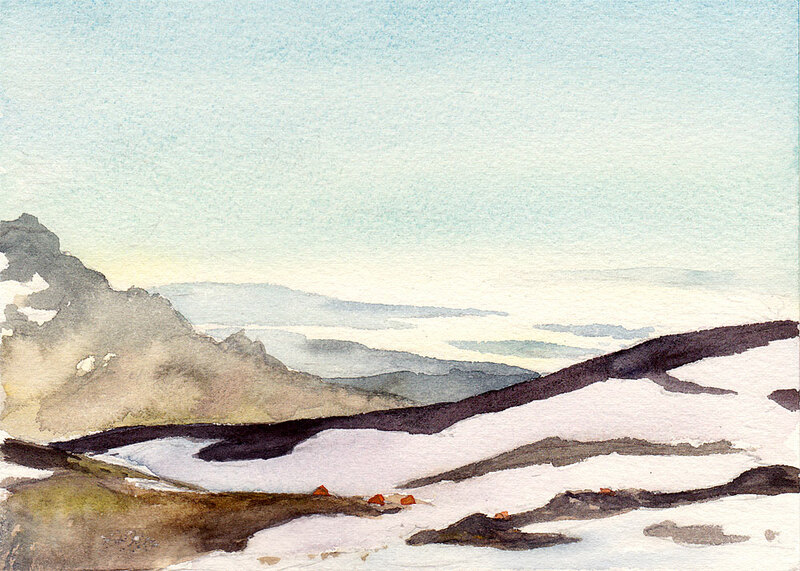 I hiked to a higher lookout and spent the day under the blazing sun completing this piece. Finally, with the weather changing and light getting low, it was time to head home, to try and reach Seattle before dark. I packed up, radioed my goodbyes and was off down the mountain. I thank the whole Girls on Ice team for their enthusiasm, warm welcome, and inspiration! 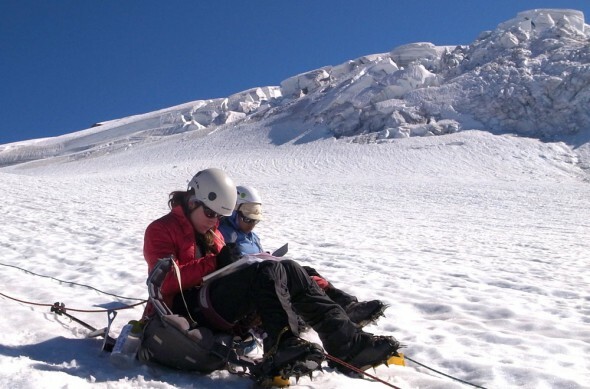 Girls on Ice is a free experiential science program for underprivileged high-school girls to learn about glaciology, mountaineering, and natural history. I encourage you to learn more and to consider giving your support. 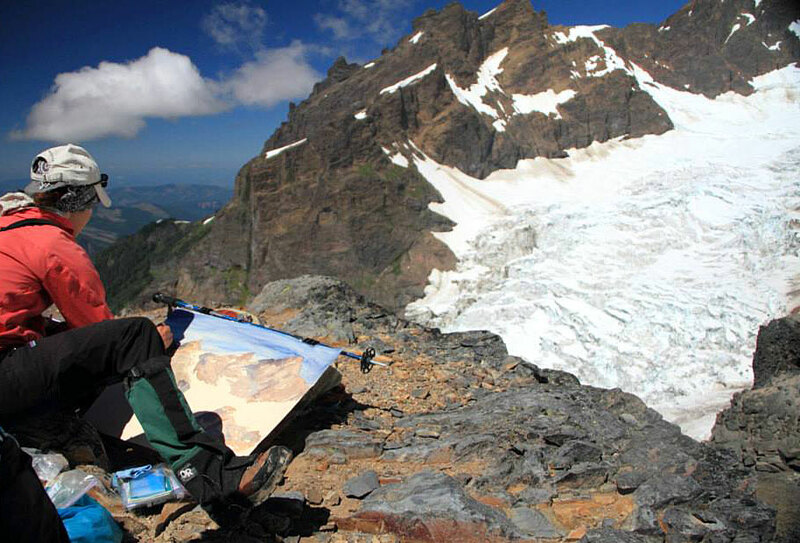 Your work is really evolving, love seeing your field sketches and reading about your travels. Keep it up! Curious about your tube/drawing board and if you could share more details. What kind of polycarbonate, specifically, and what size? Sounds great. 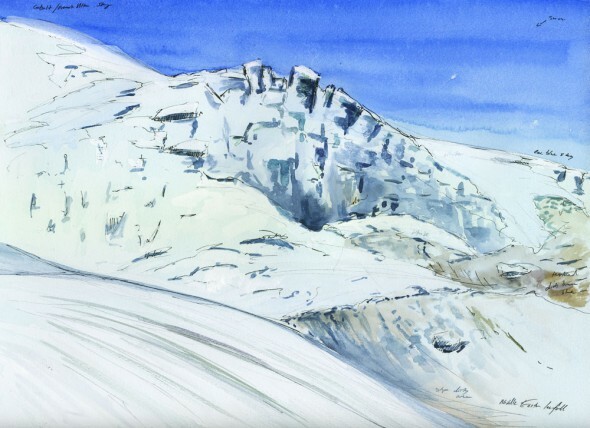 My experience sketching with NASA was captured beautifully in this short video. I want to stand up for love and compassion in the USA. 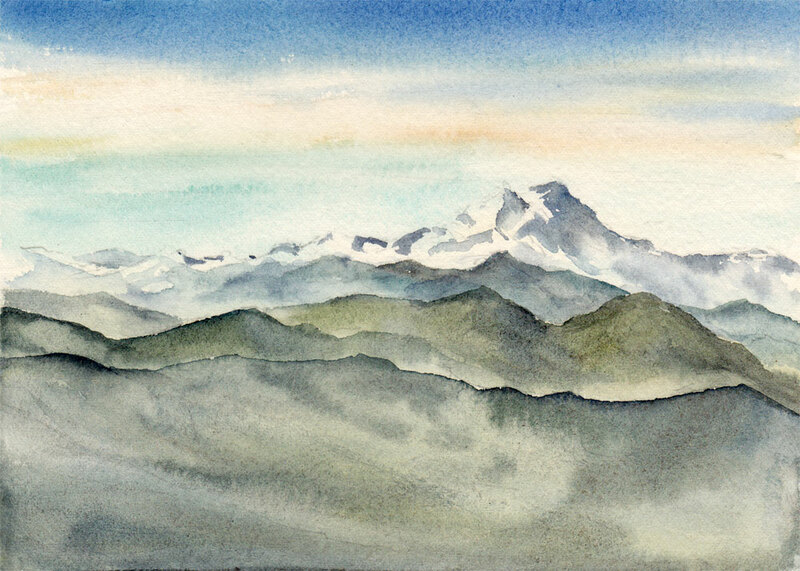 Exploring mountain quiet and light. Fall is in high gear! 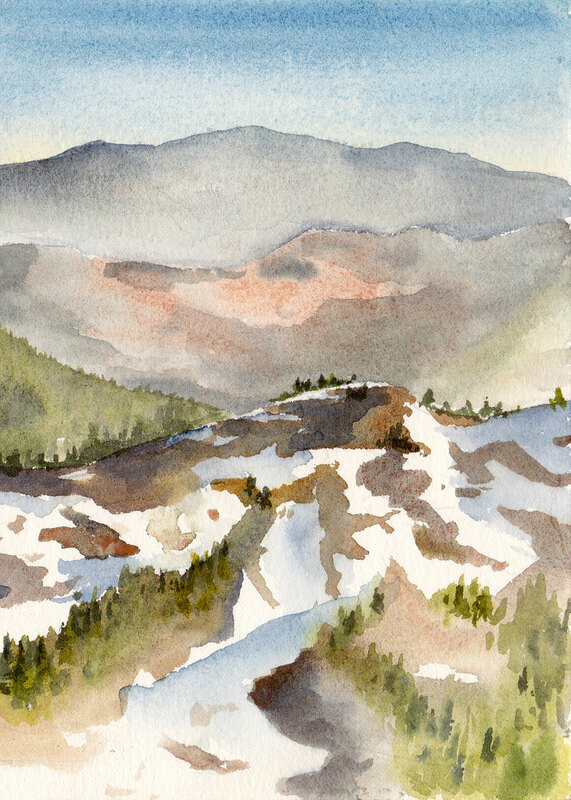 Here are some new sketches from the Methow Valley. Tabular iceberg studies from the Antarctic Peninsula. 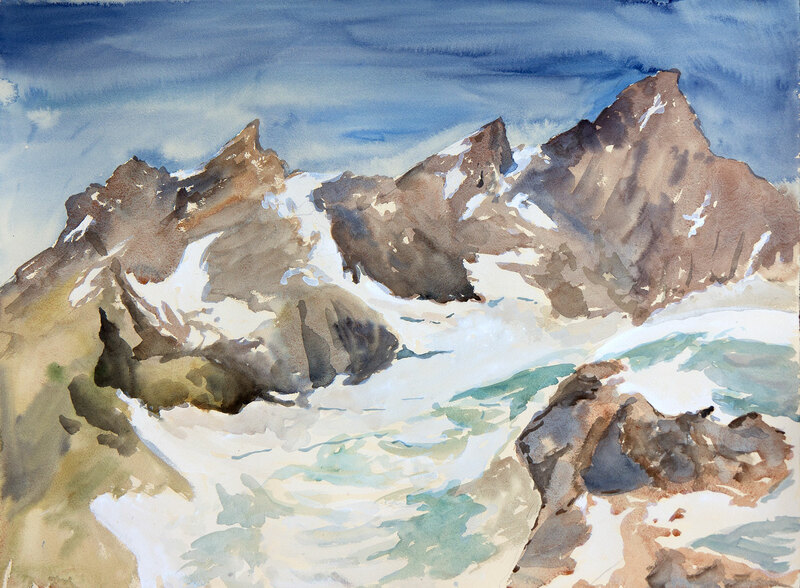 Field paintings and update from the Antarctic Peninsula. 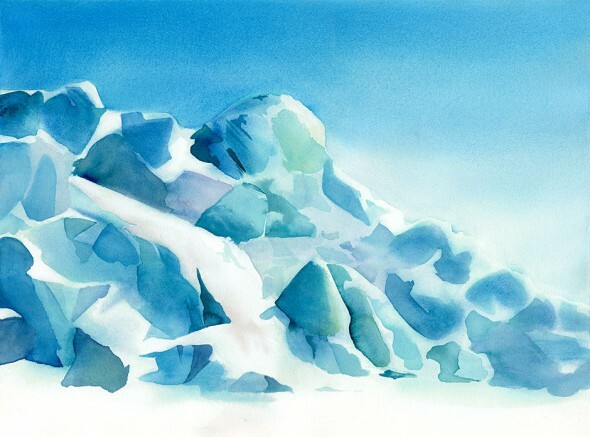 Painting rocks, ice, and penguins.